The 1966 British Empire and Commonwealth Games were held in Kingston, Jamaica from 4th to 13th August. It was the first time that they had been held outside one of the ‘white dominions’ and were followed by the Commonwealth Paraplegic Games. Thirty four nations, including Aden and Saudi Arabia, competed sending a total of 1316 athletes and officials. The nine sports were the same as had been on the programme for Perth, Australia, in 1962. Athletics won only two medals (a gold and a bronze) but as had been the case in Perth both were won by one man. In Perth Mike Lindsay took two silvers in the throws events while in Jamaica Jim Alder won his two in the marathon and six miles. Looking forward to the Games, one of the athletics highlights would be the 3 miles battle between Ron Clarke and Kip Keino. Each was thought to have a chance for a double – Keino the three miles and theMile, Clarke the three and six miles races. Alder did not figure in the calculations. In the sprints the battle was anticipated to be between Harry Jerome (Canada) and Tom Robinson (Bahamas). The ‘Glasgow Herald’ reporting was the best that they had provided for any Games so far and it is worth reproducing. The first day’s events featured several Scots – the six miles, the steeplechase and he high jump were contested by team members. “RW Clarke (Australia), the world’s greatest distance runner, by the stopwatch at least, is still awaiting his first major title. For here last night in the athletics stadium Clarke again met an athlete “he had never heard of” and the Australian was beaten into second place in the Commonwealth Games six miles. The man who did the damage was Kenyan Naftali Temu who ironically enough was one of those straggling runners that Clarke had to wade through in the Olympic 10,000m final and on that occasion another unknown Mohammed Gammoudi pushed Clarke back into third place. The humidity was such that everyone visiting here from some of the more moderate climes was dripping with sweat as the runners lined up. Clarke seemed unaware of the strength-sapping closeness as he and Temu set out on their own after about half a mile. The first mile, in about 4:25 brought that pair clear with another group containing J Alder (Scotland) content to suffer a less painful death than Clarke. Six or sven times after the three mile mark the Australian exploded away, and each time Temu hauled in the slack, persistent, game, and more than that – capable of shaking the great man beside him. Temu has obviously never been pulled out to anything like his best on previous occasions for at three miles his time of 13 min 24 sec was more than 20 seconds faster than he had ever done over that distance and there were still three more miles to go. Round about the four mile mark Clarke must have been feeling the pace troubling him, for he cut the lap times down to 72 seconds, followed by one at 75. Not slow to notice what was happening ahead of him, the small, determined Alder began to bring himself clear of those around him but the effort was telling on him. John Linaker was seventh in the steeplechase in 8 min 41.5 sec, Crawford Fairbrother fourth in the high jump with a clearance of 6′ 6″and Norrie Foster in the decathlon was fourth overall with 6728 points after running the fastest 1500 metres in the final discipline. It was a good day for the country’s athletes. On 8th August the heats of the 220 yards took place. The 100 yards mentioned above had only one Scot competing in each event – in the men’s, Campbell who was fifth in his quarter final in 10.0; and in the women’s, Alex Stevenson who was fifth in her heat in 11.3 seconds. Campbell made the semi-final in the 220 where he was fifth in 21.2, and Barbara Lyall was sixth in her heat in 25.1 seconds. On 9th August in the three miles, Ian McCafferty had a spell in the lead but finished fifth in 13:12.2, a Scottish record by seven seconds and he still had the mile to come. Lachie Stewart and Fergus Murray also ran in this race, finishing twelfth and seventeenth in 13:40.0 and 14:32.4. Ron Clarke was second to Keino. Remember that Stewart had run a good race in the steeplechase (9th in 8:57.0) and Murray had run well in the six miles. In the heat and, more important, humidity prevailing they had probably not had enough time to properly recover. The half mile final was also on that day but there were no cots there – the only half miler taken was Graeme Grant from Dumbarton and he ran 1:53.4 finishing eighth in his semi-final. There was for the first time a 440 yards race for women and Scotland had Barbara Lyall running in it. She ran 57.0 seconds to be fourth in her heat and did not get through to the final. There were no more Scots in any track events but there was still the marathon to come – and Jim Alder was in it. “JNC Alder gave Scotland their first gold medal of the Commonwealth Games seven minutes after eight this sweaty morning. No marathon is ever won without some kind of attendant drama – the 26 miles 385 yards would not seem the same if one did not cause headlines to be written about him – and this one today maintained the high reputation of its predecessors. Alder, with a lead of 75 metres as he reached the perimeter of the stadium, was sent the wrong way, lost the lead, and in what in most marathons is the glory lap, he caught his rival and won by about a dozen yards. Seventeen men lined up in a deserted National Stadium at 5:30 with a moon and stars above them that looked grotesquely out of place; the romance of the sky was unappreciated by this grim body of men, handkerchiefs at neck, sweat already gathering at the top of singlets. There was RW Clarke bobbing about pensively, trying not to think that his medal winning days were numbered – he was even considering going in tomorrow’s mile heats in a last gasp attempt for victory if he failed today – and beside him as he waited for the gun, M Ryan, a Scot by birth and for almost three years now, a New Zealander by choice. We followed them out of the cathedral-like silence into the streets of the city; not a sleeping city, but one alive and lining the route so thickly that the cars, ambulances and anonymous supporting cohorts, had for a time to nudge their way through, foot by foot. Clarke was up with the leading group headed by Ryan, J Julien, also from New Zealand, and after five miles the order was R Wallingford (Canada), Ryan, Alder, K Graham, Jamaica – bidding for eternal glory? – and, in eighth place, Clarke. For a time the Kenyan Nemesis appeared to be stalking Clarke once again – the defeats from Keino and Temu are not easily forgotten – when J Wahome’s dark figure drew within 30 yards of him at ten miles, but that threat came to naught. The homeward turn put the sun’s rays into the athletes’ faces and as the temperature made its daily inexorable climb into the 80’s Clarke was being steadily overhauled by W Adcocks (England) and Alder. At 16 miles Clarke’s lead was taken away and at 20 miles Adcocks and Alder shared the lead timed at 1 hour 47 min 53 sec, Ryan, third, clocked 1 hour 49 min 31 sec. The report continued but the race was over. Clarke dropped out at 20 miles, Brian Kilby, the reigning champion dropped out at 19 miles with a thigh strain. In all there were seven who did not finish the race. The main thing however was: it was Scotland’s first gold medal. In the field events, there were no medals at all this time round. Lawrie Bryce was fifth in the hammer and Mike Lindsay, hero four years earlier in Wales, was fourth in the shot putt and sixth in the discus. In the women’s shot putt, Moira Kerr was tenth in the shot, while Rosemary Payne was fourth in the discus. Fairbrother was fourth in the high jump, missing bronze by one inch, while David Stevenson was fourth in the pole vault after clearing 15′ 3″ – the same height as third placed Moro of Canada. 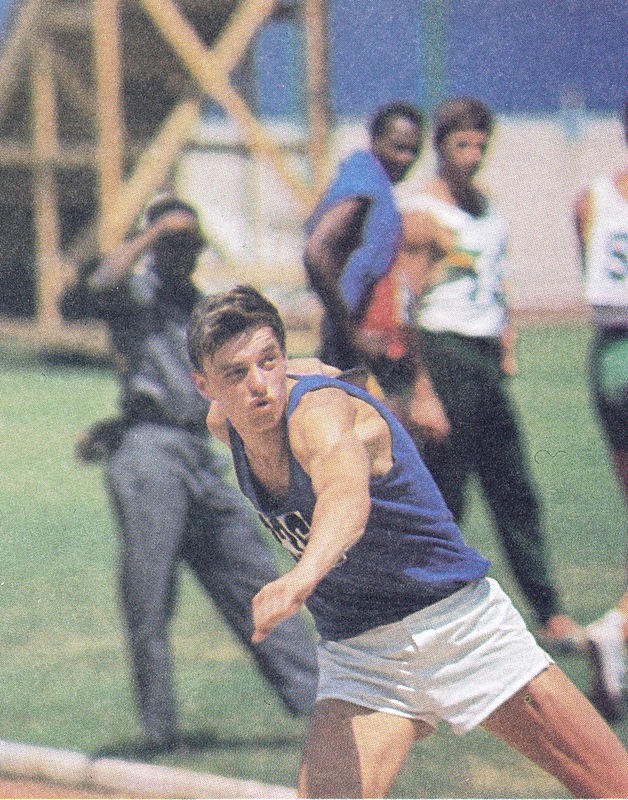 Decathlete Norrie Foster was seventh in this very technical event. Alex Stevenson was also fourth – in the women’s long jump. There were no men in either long or triple jump. No medals in field events but very good performances from many of the athletes – Norrie Foster’s fourth place in the decathlon after running the fastest 1500m at the end of a gruelling two days has to be highly rated; David Stevenson was only 6″ behind the gold medallist in the pole vault, Rosemary Payne would go from her very good fourth here to gold in Edinburgh four years later. There can however be no lack of respect for any performance by any of these athletes who competed in the heat and humidity of Jamaica. It is possible to acclimatise to the heat but you can’t acclimatise to the humidity. It was known at Jamaica that the next Games would be on home territory, in Edinburgh, and the lessons learned in Jamaica allied to the undeniable advantages of the home situation, would pay off handsomely.